I Toad You So: Tennis in Advertisements - What Is That? Tennis in Advertisements - What Is That? This is part of our Tennis Ad Watch, which is not really so much about ads for tennis, as they usually feature actual tennis players, but rather about ads that place so-called (perhaps, actual) tennis players somewhere within them. These ads usually contain a few seconds of some average Joe or Jane involved in some less-than-exhilarating match play or something taking place on a tennis court. I get it. Advertisers (usually health related) want to show someone engaged in physical activity; however, it would be a little more digestible to employ an average Joe Tennis Player or Jane Tennis Player. Some of the ads are downright hilarious. The first ad below has nothing to do with health or health-related products, but the tennis portion is quite effective and you can tell the lady tennis player didn't pick up a racket for the first time ten minutes before they began taping. Gotta love that little bouncy-shuffle-ready thingy going on after her last shot. In the ad which follows - well, I'm not quite certain what's going on with this tennis guy. If he does in fact play tennis, then I don't believe the producers knew enough to reconsider. Is he playing singles from one half of the court? And, if one is going to run through the ball to clear the net, one may as well hang out there (at net) for a while instead of using some hippity hop retreat to the baseline. Oh, perhaps this really isn't tennis. 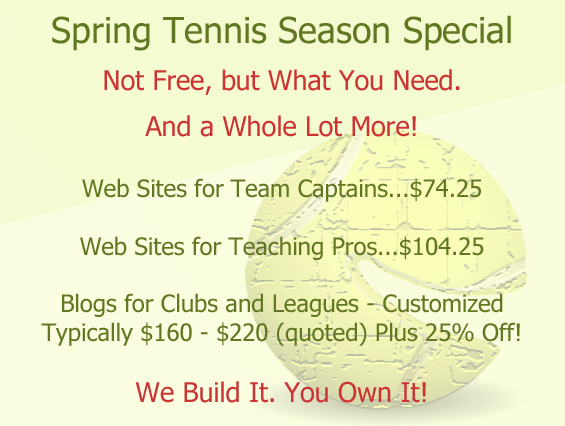 Give us your thoughts and comments or let us know of an advertisement you've seen with tennis in it.